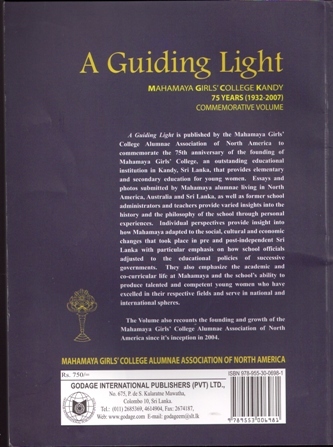 MGCAANA released the Mahamaya Girls' College 75th Anniversary Commemorative Volume at the 4th Annual General Meeting held in Boston, Massachusetts on May 24, 2008. Members of the PublicationCommittee are happy to announce that the Volume was well received. 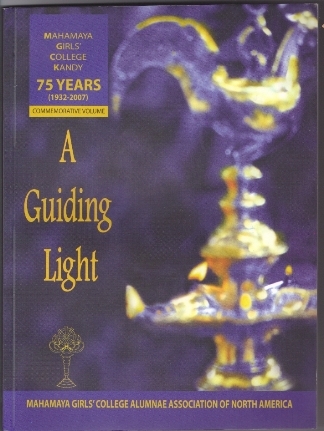 A Guiding Light is published by the Mahamaya Girls' College Alumnae Association of NorthAmerica to commemorate the 75 th Anniversary of the founding of Mahamaya Girls' College, anoutstanding educational institution in Kandy, Sri Lanka, that provides elementary and secondary education for young women. Essays and photos submitted by Mahamaya alumnae living in North America, Australia and Sri Lanka, as well as former school administrators and teachersprovide varied insights into the history and the philosophy of the school through personal experiences. Individual perspectives provide insight into how Mahamaya adapted to the social, cultural and economic changes that took place in pre and post-independent Sri Lanka with particularemphasis on how school officials adjusted to the educational policies of successive governments. They also emphasize the academic and co-curricular life at Mahamaya and the school's ability to produce talented and competent young women who have excelled in their respective fields and serve in national and international spheres.The Volume also recounts the founding and growth of the Mahamaya Girls' College Alumnae Association of North America since its inception in 2004. The Volume was published in Sri Lanka by Godage International Publishers (Pvt) Ltd. This publication is the result of unconditional love and dedication, wonderful teamwork and persistent efforts by our Publication Committee, guest editors, endless support of Boards of Directors,and the Executive Committees of last 2 years, and the Newsletter Committee and our dedicated members who supported us. We would especially like to thank those of you who contributed articles, poems and photographs to the Volume. We would like to invite you to buy a copy for yourself without fail, and please encourage other Mayans to buy copies as well. Youcan also help us by selling a few copies to your Maya friends who live around the world. Please hurry and contact Vajeera Dorabawila at vdorabawila@yahoo.com or Sujatha Werake at frontrunners4@yahoo.com for your copy! We will be waiting to hear from you. S& H charges will vary depending on the country. Please e-mail us ( mahamaya_Alumnae@yahoo.com) with the following information. We will get back to you with the S&H cost. You can order using PayPal. Any profit from the sale will go towards MGCAANA's future activities including helping our alma mater.